Drive Panels | EGM, LLC. EGM Automation specializes in constructing lower horsepower (1/2 to 100) variable frequency drive panels for use in field-mounted, motor-speed controlled applications. 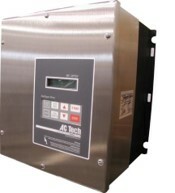 VFD panels are designed with all required accessories such as disconnect, breakers, fuses, reactors, operators, and indicators for a turn-key installation. Drive panels can be constructed with appropriate terminals or network gear included for easy connection to existing control systems or they can be further equipped with process controllers to serve as a stand-alone system. OEM component utilization can be selected by the end user or the task of specifying the most suitable brand of drive can be left to the experts at EGM.